Realizing this project presented fresh experiences to us all. Most important to me is to learn that it is possible to build a common project with four individuals, all of them with opinions and perspectives of their own, even though separated by several hundred miles and with phone and email as main communication tools. That needs discipline, commitment, mutual respect and appreciation! This diorama is a team project of „German Gamblers„ Christian Bruer, Frank Spahr, Guido Hopp and Torben Keitel; it was realized between May, 2007 and November, 2008. 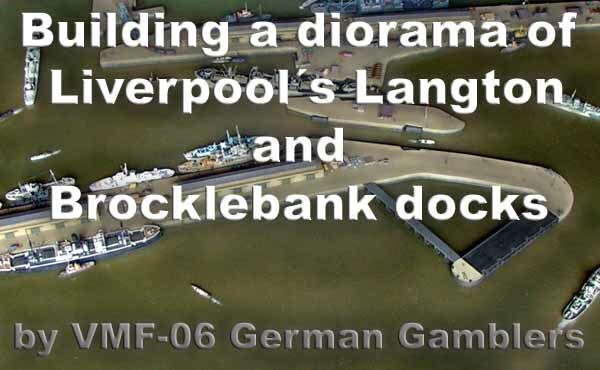 Our very special thank goes to the Liverpool Old Mersey Times Public Relations Department for their kind support in any research for photos and information around the Liverpool Dock. A special thank goes also to Andreas Krause for his precise work with his milling machine on the polystyrene dock sections and Stefan Schacht for procuring the polystyrene sheet! More of VMF-06 German Gamblers's work.